Blind Person Area Signs designate crossing areas. Signs are durable and reflective. “A must-have factor with road crossing signs is visibility to stand out for miles during the day or night, and therefore RoadTrafficSigns utilizes special 3M ink,” said Daniel Male, Manager of RoadTrafficSigns.com. 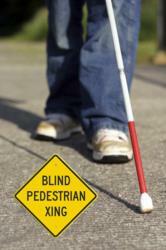 RoadTrafficSigns, the supplier for traffic signs for roads and highways, has released New Blind Person Area signs. The signs indicate that people with visual disabilities are crossing the street or intersection. The ability to walk across the street is an act that is easy to take for granted, but visually impaired people face a greater risk. According to Winknews.com, in Cape Coral, Florida, officials designated a White Cane Safety Day in Southwest Florida. Civilians walked at a dangerous intersection with white canes to raise awareness that drivers need to share the road with blind pedestrians. The white canes were used to symbolize the blind community. Bizarrely, it’s against some Florida statues to use a white cane while walking across the street unless totally blind. Signs are an excellent way to clearly designate blind person crossing areas. The new blind person area signs are diamond shaped and MUTCD compliant. The messages for Blind Person Area Signs designate areas that are reserved for Blind Children or Blind Pedestrians. Other specific signs are Blind Person Crossing Signs and also Guide Dog with Blind Man Symbol. These signs pointedly indicate where blind people cross. Hundreds of custom templates are on hand to create personal signs. The signs are municipal grade, professional products comprised of durable aluminum that will last for up to fifteen years. “A must-have factor with road crossing signs is visibility to stand out for miles during the day or night, and therefore RoadTrafficSigns utilizes special 3M ink,” said Daniel Male, Manager of RoadTrafficSigns.com. Additionally, signs have been designed for inexpensive costs, using the tip-to-tip method instead of the ‘signs-as-square’ method. RoadTrafficSigns is the leading online distributor of MUTCD traffic signs. The signs are made with long-lasting 3M ink and offered in multiple reflective grades. Customers can create signs using convenient customization wizards. SmartSign is one of America's fastest growing e-commerce companies and parent of RoadTrafficSigns.com, MyParkingSign.com, as well as more than 50 other sites. The company manufactures and distributes a wide range of signs, tags, mats, and labels. In the past, many consumers have found it hard to find, hard to design and hard to order signs with the right message. By positioning “signs as solutions,” SmartSign has taken an entirely different approach. Through highly targeted, content-rich, and authoritative retail sites, the company provides specific solutions to specific problems, such as customizing an asset tag. SmartSign is widely recognized for its quality construction; its signs come with a 3M® warranty and outlast fast-fading, ink-jet signs. Other SmartSign advantages include fast and free shipping, the Web’s largest range of designs, and a best-price guarantee.